Let me tell you the story of a medium-weight cardigan project that I’ve been working on for over a year. It came out of the in-progress basket occasionally so that I could knit furiously on it and make a ton of progress. Then it went back into the basket to make way for working on a more urgent project. This happened so often that it is a wonder I made any progress on it at all. 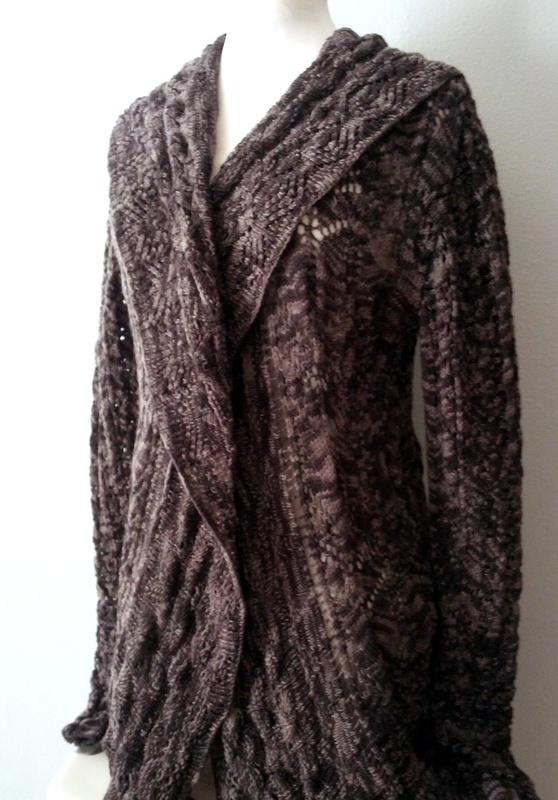 You see, this cardigan is long and drapey and covered in a myriad of lace patterns. There’s a lot of yardage in this project – nearly as much as a full sized blanket! And I encountered a few frustrating points during the finishing. 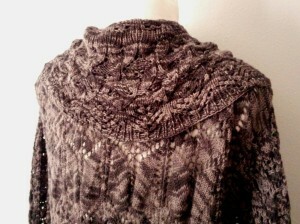 But I finally brought it to completion during the last bout of finishitis. It was all worth it in the end. I think. I mean, I’m pretty sure. Well, you’ll see. This is the Lestrange Cloak, by Catherine Salter Bayar, published in The Unofficial Harry Potter Knits special issue by Interweave in 2013. The design does a very good job of evoking the character of Bellatrix Lestrange, from the Harry Potter stories. Being a fan of all things Harry Potter, lace, and dark colored cardigans, I had to knit it. I made one modification right away. The pattern as written is for a nearly knee-length cardigan. (Knee-length being a relative term, usually applied to models of 5′-8″ and taller.) In the first place, I don’t need a sweater that long – I’m only 5′-3″ after all, it would fall below my knees. In the second place, I only had approximately 2600 yards of my chosen yarn. (This is usually an enormous quantity; my typical sweaters only take half this amount!) 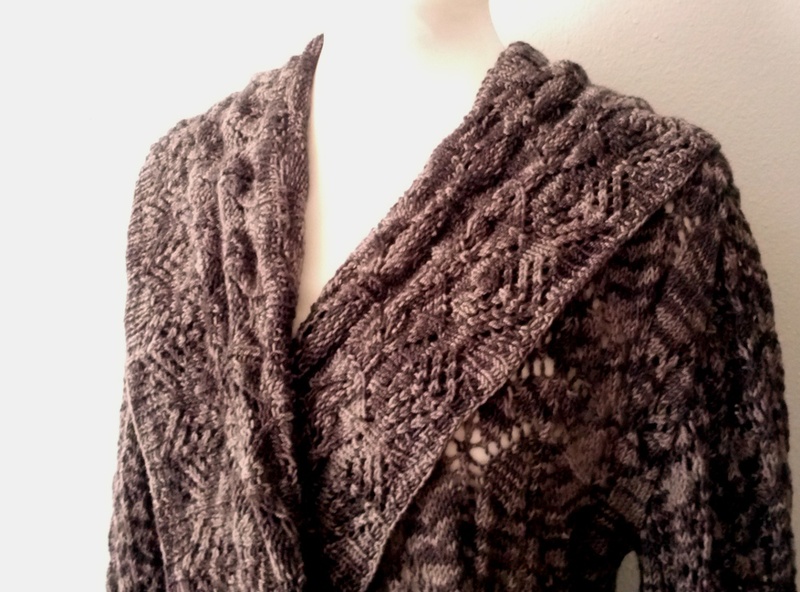 I could handle both issues by omitting one lace repeat lengthwise in the body of the sweater. This worked beautifully. My second modification came when I was in the middle of working the hem pattern. The sweater body is knit first, then the sleeves, then the (extremely) wide fold-over collar that runs the length of the garment, and finally the hem of the body. Once I had finished the collar, it was very clear that I was not going to have enough yarn to knit the very deep hem as written. So I kept the spirit of the pattern, while altering the row count to finish off the sweater with several yards to spare. This modification worked beautifully as well. Here’s where things went a little wonky. I tried on the finished sweater…and the seam where the sleeves meet the body of the sweater fell off my shoulders and halfway down my upper arm. But wait, you might say, some sweaters are constructed like that on purpose. Yep, that would be called drop shoulder construction. That is not the case here; these are set-in sleeves, like you would see in traditional tailored shirt/sweater/jacket construction. That seam is supposed to sit nicely at the joint between my shoulder and arm. Except it wasn’t. It was making an ugly puddled mess on my upper arm. Did I do something wrong? Forget some shaping? Checking the pattern…no. There’s no shaping in the upper body at the armhole that would match the sleeve cap shaping. The designer expected that the natural curving of the lace pattern would do that for us. It very likely worked out just that way in her knitted sample, for her model-sized model. But apparently my mileage varied – or my shoulders are not as wide as her model – and 6″ of fabric between the neck and sleeve seam was entirely too much for my needs. By comparison, a survey of my closet shows that 4″ is more appropriate for my size and build. Out came the handy dandy crochet hook, some of that leftover project yarn, and a little gathering seam was created on the wrong side of the original seam at the shoulder (where the back and each front are joined together). Final dimension of this line: 4″. Does it fit now? Yes! The length is perfect, the fit is flattering, the collar is nice and snuggly, the sleeves are a tad longish but workable, and the yarn choice was good. The yarn is super springy, so the sweater shouldn’t sag out of shape while I’m wearing it. Overall, yes I’m happy. Now…bring on the fall weather! 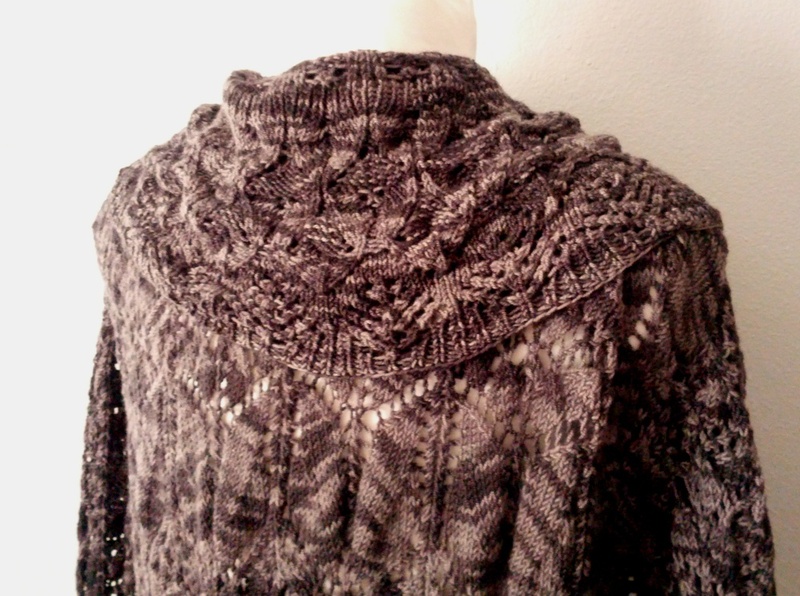 This entry was posted in Knitting and tagged fall, knitting, lace, sweater, winter, wool. Bookmark the permalink.